Although your DNA is inherited from your parents, the environment still plays a major role in determining which genes are activated and when. Harmful chemicals in the environment can throw a wrench in your body’s genetic game plan. How do the wrong chemicals end up in your body in the first place? 1. Diet. Ingesting food or beverages containing harmful chemicals. 2. Exposure to harmful chemicals in the environment, either through inhalation or skin absorption. 1. Directly mutate a gene. This can result in an alteration of the gene’s function, complete loss of function, or no effect at all depending on the type and location of the mutation. 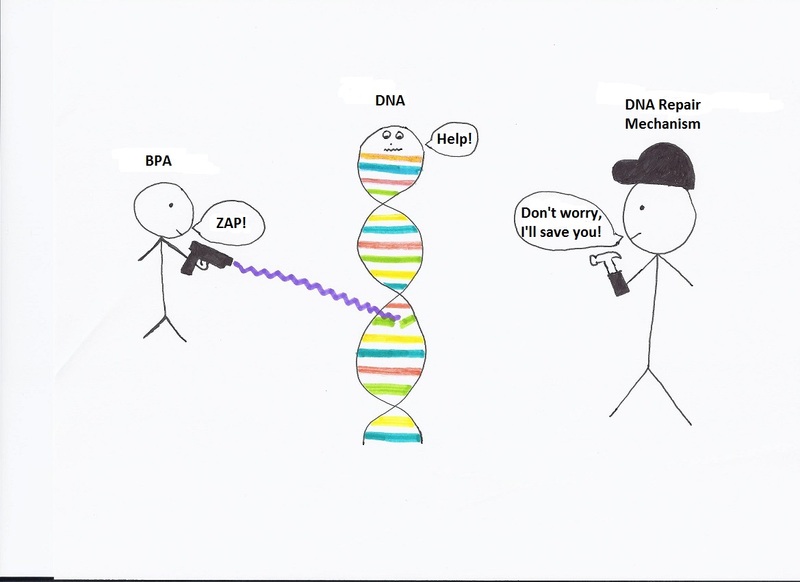 All cells in our bodies have DNA repair mechanisms to identify and “fix” damaged or mutated DNA, however the efficiency of this mechanism varies from person to person. Just as some people have stronger immune systems and don’t get sick as often as others, some individuals have better DNA repair mechanisms and thus their bodies can handle more mutation-causing chemicals. 2. Act directly on a gene to turn it on or off. Chemicals can bind to genes in ways that can either activate or deactivate them. 3. Act on a regulatory gene that then turns another gene on or off. Many genes are part of pathways in which one gene’s product activates the next gene in the pathway and so on and so on. Most of our DNA does not code for anything. Some genes code for proteins or RNA molecules that have some sort of perpetual function in the body. Other genes are only needed during development and are thus only turned “on” when appropriate. Certain toxic chemicals that enter our bodies can activate or deactivate genes at incorrect times. This is why exposure to chemicals is even more harmful during pregnancy. As the fetus develops, different gene pathways are turned on and off at key stages of development to ensure every part is formed correctly. Interference of the wrong chemicals (through exposure to toxins or extreme stress) or absence of the right chemicals (due to nutritional deficiencies or stress) could sabotage a certain stage of development resulting in a birth defect. There are even some genes that are only activated by extreme conditions (ex. during starvation of the body) as a survival mechanism. Some people, although few, are lucky enough to have “good genes”. Their DNA codes for strong immune systems and highly efficient DNA repair systems. They can throw caution to the wind regarding their lifestyle choices yet still make it to old age with their health intact. However, for the majority of us, a good diet and conscientious lifestyle choices are our best shot at living out our retirement days disease-free and with our wits intact. Even those with “bad genes” (those genetically predisposed to illnesses), can change their fate by being extra conscientious of their surroundings, and of what they put both on and in their bodies.